This is, the hormone house. Oh it’s such fun, fun, fun, woah-oh. We’re all quite sane, sane, sane, wooah-ohhh. We’re happy heeeeeeerrreee ohhhhh oh. Aged seven and forty six, it’s a great mix. In the hormone house. Wooah-oh. This idea popped into my head on the bus tonight. With thanks to Siouxsie and the Banshees for creating it in the first place. Sorry, normal service to be resumed soon. We had a rare night out last night – our second this year. 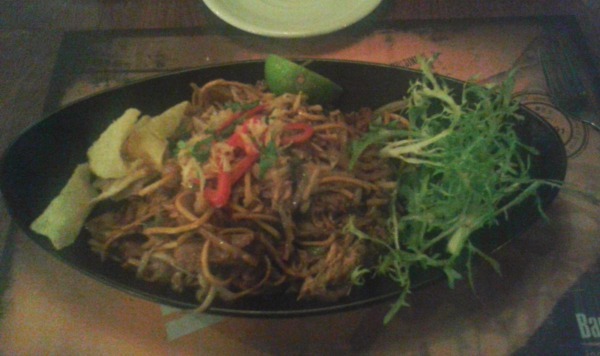 A proper date night, although most of it was talking about all the things we haven’t talked about (fears, worries, happy, sad things, annoying things, taking the mickey out of things) – and that was just on the train to North London. I’m lucky with my job, I get free tickets to see most of our bands. Last night was the big staff night out to see Queens of the Stone Age at Wembley – the second of their two nights there. The last time I went to a gig there would be Duran Duran around ten years ago so it’s been a while. Childcare was arranged with Karen next door – H had a sleepover – so we were set to have a proper night out. 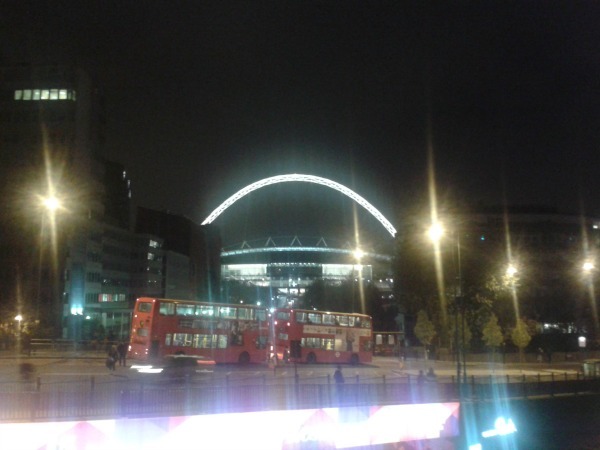 After that it was a trip up the Jubilee line to Wembley, and a walk to the venue which was pleasant enough. We bumped into Eileen from work and all walked up there together, where we found she was on the opposite side of the venue to us – we all had brilliant seats though, almost next to the stage at the side. Oh boy, those drums and bass made our seats rumble at times as well. QOTSA were amazing. Really amazing. I’ve never seen them live before – I’ve bought their albums since 1990’s ‘Rated R’ which still reminds me of old workmates when I hear the songs. Josh Homme has a funny kind of magnetism – a proper showman, the backdrop to them was the kind of thing you could watch when you don’t want to watch a band play their instruments, and even doing the “are you all enjoying it over there? Are you all enjoying it over there?” type chat wasn’t annoying, we all cheered back at him, Josh was talking to us – he cares. You can tell they care. At one point (I’m paraphrasing) he said something like “you can love someone too much. You can love someone too much” and Shaun said “yep, H does that with you” (she’s a little obsessed with me at the moment, declaring earlier today that “Daddy can sleep in my room tonight as I don’t want to sleep on my own any more, I want to sleep with you mummy, then when I get a little sister I can share a room with them”). We both smiled. They also had a brilliant lightshow going on. It was brilliant to get out for the night together. Those moments are rare – we’re a staying in kind of family who do things together – including H. It’s nice, but it’s also nice to get some proper grown up time. Of course, we got home having navigated our way around London’s closed networks (why do they close the Northern Line on a weekend?) finally getting in for around 1am with some nasty chips from a late night place and fell asleep on the settee waking just after 2am. So all the talk of feminism made me think far too much yesterday, it was one of those days. You know, when you don’t want to do much and you spend way too long daydreaming. A look at Sarah Ditum’s blog brought up a recent post on Riot Grrrl – and while I wouldn’t stick my neck out and say I had been one, I was definitely there for a couple of the significant moments, so I figured I may as well waffle about them on here while they’re in my head. I saw Huggy Bear and Bikini Kill live. But it’s not as simple as that. Both bands believed that women had a right to be down the front at the gigs – something I did anyway, so it made sense to support it. I wasn’t keen on all-female gigs with no men allowed but understood why they did it. I saw Huggy Bear one night at Dingwalls in Camden. I went on my own, my friend didn’t want to come with me so I stood about waiting for them to come on stage and hoping I’d see someone I knew. As it was I spotted Tim & Laetitia from Stereolab so hung about with them that night. I knew Tim from his McCarthy days when we’d hung out with them at gigs prior to that. Just before Huggy Bear started I seem to remember someone coming on stage and ripping up Melody Maker, urging us to reject the music press, and ranting to us about sexism in there (it could have been NME, and was probably Liz Naylor who released their records). It was pretty powerful, and I don’t remember a thing about the live show. That bit stands out. Fighting back. We all clapped enthusiastically and Huggy Bear got on with what they did, marvellously. I walked out of the venue back into London, things were different. I was still a girl from a little City, but I’d seen something exciting that night. A few months later and this time I’m on a work outing, either a minibus or a small coach to TJ’s in Newport where Huggy Bear and Bikini Kill are playing together. We’d just released a split album by both bands so we’re all on the guestlist. Oh, and it’s dubbed the ‘Newport Riot Gig’ as it really was quite mad. There’s a few of us from work there, and we’re ready for Huggy Bear – though I seem to remember the set being cut short – there’s some tall bulky men down the front and they’re heckling, giving grief to the band refusing to move. I wasn’t down the front, it was too packed – I stayed near the back. It looked intense. It WAS intense. Huggy Bear may have cut their set short and I remember a large chap at the front, he was the mouthy one. He might have stood at the front, arms folded refusing to move. Kathleen Hanna was on stage by then and I believe she refused to play until he moved back, until women could get down the front. Then it started – a few people sat at the front on the floor. I know Heather was sat there. Ian was at the side of the stage. Rebel girl! Rebel Girl! Rebel Girl! You are the queen of my world! It’s a few people, then slowly it’s everyone – men and women – but not the mouthy ones. I seem to remember them going to the back of the venue and further heckling, spilling beer and being annoying. I don’t know. Like a fight they refused to give up despite backing away, getting that last word. The gig wouldn’t start until the women were down the front. Kathleen Hanna won. We were all winners. The gig happened, it’d probably be a cliche to say that the crowd singing Rebel Girl turned into Bikini Kill joining in and singing it, but it was 1993 and that’s twenty years ago and it might have happened, in my head it did. That was all though. Just two moments of that time. Back then I was twenty three, a different me to now. Back then I was living in Bristol having made the big move from home to keep my job in music. The worst things I was dealing with back then were homesickness (I’d drive back to York most weekends) and a lack of friends. That all sorted itself out in time, fortunately. I love that the top commenter says it’s her auntie playing drums. Twenty years though. I still don’t feel like I’m a feminist, but I get the feeling that’s due to my lack of labels. We’re probably living in the same town. There were just the three of us again, it was a Wednesday evening and we’d travelled from York, hoping to get the 1.30am train back home again. Leeds Warehouse was our destination as The Bodines were playing that night. I was pretty excited as Happy Mondays were supporting, a band I’d heard a bit about but wanted to know more. All I knew was there were lots of them, they were signed to Factory and that Barney from New Order produced their second single. I don’t remember much about the gig. They played, they played lots of songs from ‘Squirrel and G-Man’ the first album. I remember hearing ‘Desmond’ – the track which was removed from later pressings of the album. But I don’t remember much else. I came away from the gig knowing I wanted to see them again. 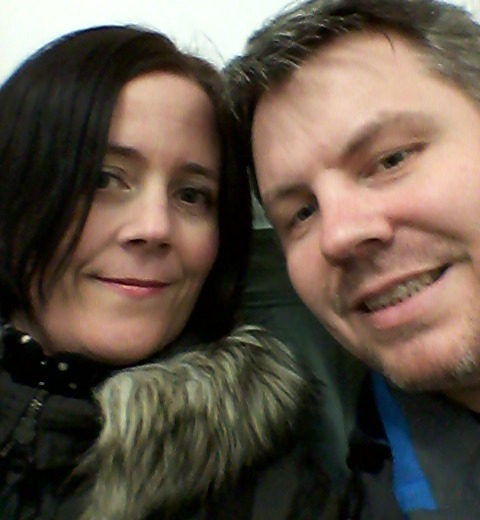 I was at London Astoria with my then-boyfriend. I’d travel down to London to hang out with him and watch bands. The thought of H doing that when she’s eighteen fills me with fear, my parents must have really felt it but good on them for trusting me. Loop were playing with a mysterious support. Ends up it’s Happy Mondays, possibly the least well matched support band for Loop, ever. People I currently work with went to that very gig and say pretty much the same thing. The Mancs on stage doing their thing, me happy as I’m getting to see them again even if nobody else seemed to care. This time the music felt coherent, like there was a proper dancey rhythm going on, down the front I stood taking photos, happy I had caught them live. Their second album ‘Bummed’ had been released a couple of months before then, an album I already owned so I knew the songs, I was happy too. 10th February 1989. Probably a Saturday. Happy Mondays played ULU. I don’t remember anything about it. I was there though. Probably drunk. This time it’s Leeds Warehouse all over again, nearly two years since the first time. Support comes from The Bridewell Taxis who were kicking up a bit of a storm in Leeds at the time and seemed to get all the ‘baggy’ support slots. This time things were better though, I was with my friends and had my tape recorder and extra batteries – and snuck into the venue early. Back then I wrote a fanzine and you went for your moment when you could. People bought my fanzine and seemed to like it – I could easily shift nearly 1000 copies per issue, and it was all my own work. That was kind of weird but good. 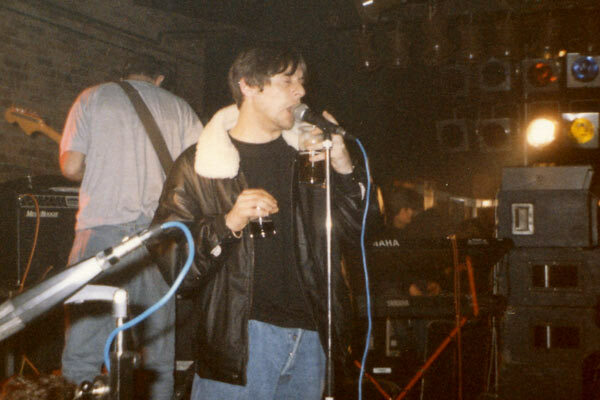 So I got chatting to the guitarist Mark Day, then Paul the keyboardist, before Shaun Ryder joined us and was a great interviewee and I remember thinking he was a top bloke and felt like he respected us – we weren’t some piddly fanzine writers (although we were). I complained about their t-shirts costing £8, and he returned with one and said to me “here, have a dressing gown”. Some random bloke also gave us some grief and he said to come and find him if he continued and he’d ‘have a word’. But no, no more hassle from this man, Mr Ryder was great, and I was pretty happy with my interview. The gig was excellent too. Right down the front getting the best photos I’ve ever had of the band. I got that 1.30 train home too, it still existed then. The keyboard player said he’d put me on the guestlist for their gig at Manchester International 2. I’m in Manchester. I am with two chaps I know, random ones, one of whom owns a car so therefore he drives us to the gig. We’re staying at a friend of his house that night, and I seem to remember us going to the arts centre, the name of which escapes me to all watch The Manchurian Candidate. After that we drove to the venue, and somehow got in. 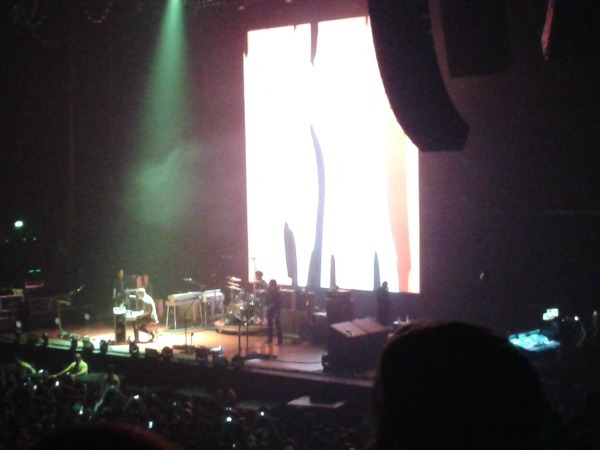 The band was amazing, possibly the best time I’ve ever seen them. Tony Wilson was walking around the venue in a long white suit, we stood in awe as Mr Manchester was there in front of us. I took no photos. It’s just stuck in my head now. The band played a stormer, we all left smiling. We ended up going to the old Factory club for a random night there, much of which I don’t remember other than having to walk through Moss Side in the early hours of the morning. We all stayed at some random friend of theirs house, then headed back to York the following day. That’s it really. I think sometimes I need to repeat my own life to myself to think about how I will slowly let go of things with H when she gets older. I know that time will come. I know I have plenty of time ahead of me to think about it, but right now thinking of my mum and dad and the amount of freedom I got from them in my later teens, I just have to thank them. Then learn that at some point you let go. Not quite yet, but one day. I’m adding this to Flashback Friday, for no reason other than I saw Happy Mondays are touring Bummed at the end of the year, and all the album was released 25 years ago. Oh my. A few individual letters after getting a bit sick of my inbox. If you’re going to start sending me emails in the future based on my iTunes purchases, I’d really like to opt-out. The purchases I make are music for my daughter. I don’t need suggestions based on The Wiggles, thank you. Please stop sending me emails telling me there’s new music from The Fall available. I know this. When I get a chance I’ll be listening, I haven’t forgotten. Though at least you’re getting it right – just stop sending the same email weekly please? Thanks. You send me too many emails. You also have too many ads on the free version, so I don’t use you as much. Don’t take it personally. Thank you for sending me emails suggesting music I might like based on my search preferences, however, there’s a problem. I’m often checking on your site for work-related things, so suggesting I’d like the new albums by Deerhunter, Queens of the Stone Age and The National is nice but I already have them – direct from our warehouse. It’s a bit like me sending you an email asking if you’ve heard of free super saver delivery or something. Thank you for only sending me emails with offers, it’s SO refreshing. You never suggest things I might like, I like this, it’s like we’re courting, you don’t know anything about me, and you’re being aloof. Keep it up, I actually read your emails to the end. Firstly, watch the video. You will see several small child funny things. A cannonball (“look mummy! A cannonball! !” – falls over laughing as it’s so funny). Kim Deal underwater singing or air bubbles coming from her mouth or blowing a whistle (“ooh mummy, the lady is good at putting her face underwater too like I do in swimming!”). Kim doing her “Wahooooooo-errrr” bits (“this is fun to dance to!”) and Josephine’s bouncy bassline (“LOOK MUMMY! I’m JUMPING!”). H is a fully paid up member of The Breeders fanclub, thanks to one song. Good job really as her mummy and daddy already are. I’m not a Feist fan, but do like her ‘1-2-3-4’ on there. Our most favourite of all is Tilly and the Wall doing the ‘ABC’ song, complete with tapdancing (as that’s what they do) which would be on repeat even more than The Flaming Lips. There’s also a charming little song which counts up to twelve which we still often sing. There’s a faster lite-punked up one that goes up to twenty as well. Having chosen The Muppets over Sesame Street when I was of that age it’s a new world for me too. I think this proves my point. I rest my case until something else comes along. That or it was just a lame excuse to mention The Breeders again. It’s obvious, and I can’t believe it has taken me this long to think of. As you may or may not know, I have been getting more and more annoyed at kids in band t-shirts when you know full well they haven’t a clue what they’re wearing. H has the ‘What Would Joe Strummer Do?’ t-shirt from Nippaz With Attitude which a few friends flagged with me, going on my rules. They have a point, but considering Joe Strummer didn’t release an album called that (or at least if he did I’m not aware of it) complete with graphics like that (I’d say I’m fairly safe here), then it counts. 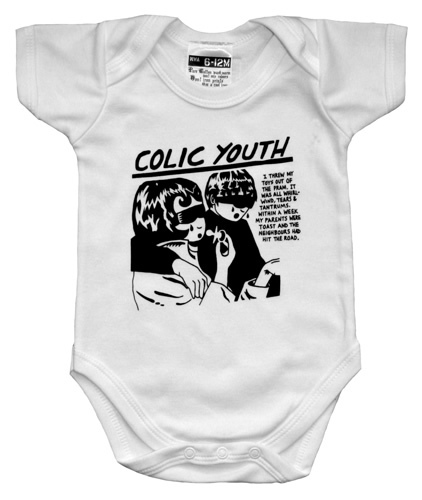 Funny nods to the music your parents like that you may have heard are borderline acceptable – like the Colic Youth shirt they do – they’re funny and aren’t to be taken too seriously. This is my adequate solution. You see, having worked in music for so long now, H has to listen to music I like alongside ones she does. So far she’s liked some things (particularly an Echo and the Bunnymen drumbeat) and hasn’t disliked a lot. We’re easing her in gently so she doesn’t get too angry, and we’re set to do a fair bit of driving soon so we’ll be choosing songs we all like. Having worked in music means I know some of the bands – which in turn means H knows them too, and their children – and two immediately spring to mind. H has heard their music and liked it, and can’t get her head around the fact they’re singing on YouTube – step forward Emma from Lush and of course Rachel from Mojave 3, Slowdive and her own fabulous solo album. H isn’t at the stage of singing any of their songs yet, but I’m looking forward very soon to the time she’ll wear a ‘Split’ or ‘Souvlaki’ t-shirt and will know the music as well as knowing one of the people behind the music. Now THAT feels right. Rachel’s solo album has a lovely sleeve – she has the picture on her wall and I love it. I think a t-shirt based on that would be GREAT! I speak about music related things with my most indie-est of snob hat on – and I’ve spent good money through the years on band t-shirts, but that’s the thing – they’re band t-shirts of bands I like. So is it fair to dress up my child in a t-shirt featuring a band she’s probably never knowingly heard? Yes yes, I did have a Fender t-shirt for her when she was one, so I have been suckered into all that, but to me having say, The Rolling Stones on a t-shirt isn’t cool or funny – unless that child happens to love a bit of Jumping Jack Flash, that is – I’d much rather see a take on it which says “my parents bought me this” such as Nippaz With Attitude ‘Colic Youth’ which I still think is hilarious and one of the best things I’ve ever seen – and even the AB-CD ones in the ACDC font are funny. It’s a bit like when Top Shop started selling band t-shirts. Bands most of the ladies who wore them probably didn’t even own the record of – it’s set off some kind of trend and I DON’T LIKE IT. Ladies, have you really heard The Ramones? Really really? How many Ramones does it take to change a lightbulb? Answer me that. If you know the answer then I’ll forgive you. But I don’t. He’s only three. He’d probably look at me oddly. Instead, I buy my daughter a Beatles t-shirt from TK Maxx for Red Nose Day 2013 and immediately contradict everything I feel strongly about. I’m a bit like that. In short, BBC4 keeps putting on some great and watchable documentaries about bands I don’t like. Their songs stick in my head for the following few days and I feel like I have a greater appreciation for them than I used to. Two examples – Pink Floyd and Queen. Pink Floyd were a bit boring, though the Syd Barrett bits were interesting. Queen, however – we watched both parts, god, Freddie was a good showman wasn’t he? I still remember where I was when I heard he died (I woke up and it was the first announcement on the news). But yes, if they could just show some more bands I like I’d be happy. That’s when I can get ‘Those Were The Days Of Our Lives’ out of my earworm-ridden-head. Damn you, BBC4.